The head of the EU's diplomat service has met the President of Cuba at the end of a two-day visit aimed at strengthening engagement with the Communist country. Broadcasting footage of the meeting, state-run television said it covered the favourable state of relations between the EU and Havana on international issues. 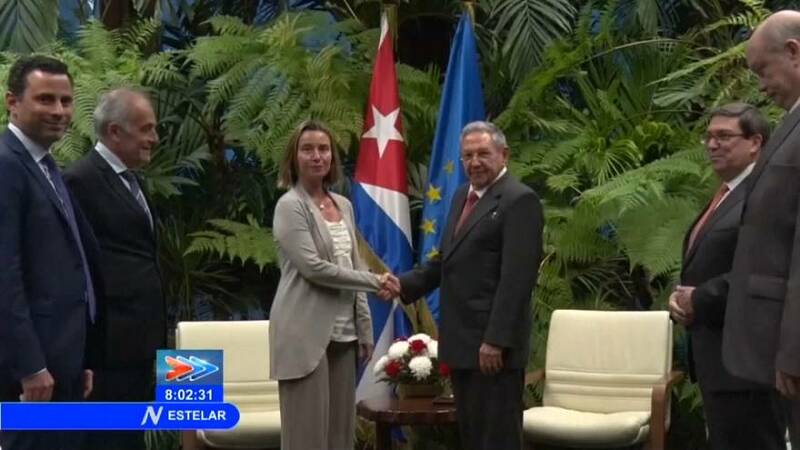 Why is Federica Mogherini in Cuba? At a press conference earlier in the day, she said EU member countries combined are now Cuba's most important economic partner. She announced a series of agreements. Speaking to journalists before meeting Cuban Foreign Minister Bruno Rodriguez on Thursday, she said the closer relationship also provided new potential in trade and investment. She said a delegation from the European Investment Bank would visit Cuba later this month. Cooperation agreements in renewable energy, sustainable agriculture and expertise valued at 49 million euros would be signed shortly. What about the US trade embargo? During her visit, Mogherini repeatedly criticised the US trade embargo and said she regretted "that the current US administration has apparently changed course with Cuba". Are any more meetings planned? Yes. In Febuary, Mogherini will preside with Rodriguez in Brussels over the first joint cooperation meeting between the EU and Cuba. As the U.S.-Cuba rapprochement unfolded in 2015-2016 the EU dropped all sanctions and negotiated a political dialogue and cooperation agreement, the first between Cuba and the EU. Is there a window of opportunity? Diplomats think so. Castro is expected to retire in April. Market-oriented reforms are already underway. "i believe that Europe has the potential and interest to take an independent agenda in Cuba in economic and political matters for strategic purposes," said a senior Latin American diplomat. "Cuba does not cost so much and is very symbolic worldwide. At the same time, it balances the growing Russian and Chinese influence." Brookings Institution economist and Latin America and Cuba expert Richard Feinberg says Cuban commerce is so spread around the world today that no single country accounts for more than 20% of its total trade. "The EU has become Cuba's first trade partner and was already the first in investment and development cooperation..which means it is possible to increase the level of economic relations and investments" - Mogherini said before meeting Castro.